The word endodontics might not sound familiar to you, but you’ll recognize the alternate name for it: root canal therapy. Many patients feel anxious when they hear they need a root canal, but with today’s technology and techniques, treatment is more comfortable than many realize. And at Mod Squad Dental in San Diego, we take special precautions to ensure that our patients feel comfortable and relaxed. But first, you might be wondering why a root canal (or endodontics) is necessary. In many cases, it’s because of a bacterial infection that has developed inside the tooth due to a deep cavity, a crack, or an injury. Such an infection can cause painful symptoms, like sensitivity to hot and cold. If treatment isn’t administered, the tooth may be lost, but with a root canal, the tooth can be saved and your oral health restored. During an endodontic procedure, Dr. Friedman will remove the damaged pulp from inside your tooth. This pulp is what makes up the tooth’s nerve. Then, after the pulp has been removed and the interior of the tooth has been cleaned, it will be sealed with a special substance and capped with a custom-made crown to protect it for the future. Are you worried that you might need a root canal? Dr. Friedman would be happy to help you with a consultation appointment at his San Diego dental office. Call us today to reserve a visit. 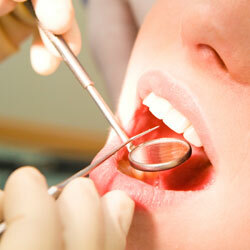 During your appointment, we’ll complete an oral health assessment and propose a treatment plan designed just for you. We serve patients from San Diego and beyond.